I can see why. I’d like to read The Legend as well. I need to get cracking on a Roth cover-to-cover read-through. Sounds like every one of his writings is worth it. And so different. That’s what amazes me the most. The Flight Without End is so different from this. I’ve got a whole collection and am reading my way through them. It’s actually surprising he was so prolific since he was such a heavy drinker. And died rather young. That’s journalistic discipline for you! I think he was constnatly high in a way, writing, writing, writing. He looks so aged on his photos. You’d never think he died quite young. He was with Irmgard Keun for a while and she too I think was an alcoholic. Your description of Joseph Roth makes me think of Balzac, Caroline. The only difference was that Balzac drank lots of coffee and wrote, wrote, wrote, while Roth drank lots of alcohol and wrote, wrote, wrote. This novel sounds fascinating. That question of how good people deal with bad times always an interesting one. I suppose noone can emerge from such times unscathed. It is an interesting question and after a while you even wonder – if almost everyone cheats – isn’t that the new norm? Should he have accepted it? This sounds great, as does everything by Roth, it seems. Is his awakening to nature an acknowledgement that a little flexibility with the rules is the natural way and that anyone who is too inflexible will break because they are fighting against nature? Interesting question. I read it little differently. For me it rather was a sensual awakening and that’s what broke him because he wasn’t equipped. I would have to reveal too much about the book but if his love affair with Euphemia had been different and not as chaotic as it was he might have been able to cope and the his newfound felxibility wouldn’t have turned into a curse. Oh, this sounds absolutely tremendous, especially given the focus on the moral and ethical choices this man has to make. I’ve yet to read Roth, but I’ve enjoyed seeing the reviews flying around the web in the last couple of days. I’ll have to add Weights and Measures to my list. Thanks for this review. My pleasure. I’d be glad to know someone else will pick it up. I think it’s a wonderful book. There’s a review of this one at mine. I’m delighted to see someone else read it, it’s a bonus to then have such a perceptive review. I particularly like your point on him awakening to the seasons. Roth really is a marvel. Yes he is a marvel. Thanks for the the kind words. I’m looking forward to read your review. I don’t remember seeing it. I’m surprised every book is so different in tone and choice of themes. Beautiful review, Caroline. I want to read this book. 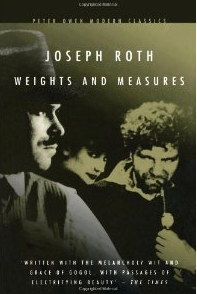 The main theme of ‘Weights and Measures’ is very interesting. It is sad that things end dark and bleak – I wish there was a third option for a honest man other than becoming part of a corrupt system or going down. Mysterious gypsy women characters come all the time in Russian novels and movies. I didn’t know that they made an appearance in Joseph Roth novels too. I loved your comment – “I thought this was an absolutely remarkable novel” – now I know who one of your alltime favourite authors is 🙂 I love that cover image of the book. I love Peter Owen editions and it was no nice to see that cover – it has a noir feel to it. I haven’t read a Joseph Roth book yet. I should be able to do something about that in the next few days 🙂 I just started reading ‘Flight Without End’ and I am loving it just after three pages. He is a wonderful writer. Flight Without End is very different. It’s even humurous in place but I like it too. Weights and Measures is more poetic. Just for those descriptions of nature it would be worth to read it but Radetzky March is still his masterpiece. I’m slowly reading all of his books. The one Stu reviwed sounds very tempting too. And of course Hotel Savoy is a favourite of mine. I would have wished another option for Eibenschütz but the only option he had would have been to leave. But he feel in love . . . The tragic decline of individuals can make for such strong fiction. The ethical questions do sound interesting, as based on your commentary it was not the protagonist who was really flawed but was brought down by the ills of society. I have not read Roth but I want to. I’m sure you’d like him, Brian. It’s a depressing story. He doesn’t stand a chance. Excellent review of a brilliant book. There is also a movie by Bernhard Wicki with the unforgettable Helmut Qualtinger (“Herr Karl”) in the leading role based on the novel. Also very much recommended. Thanks a lot. It’s a wonderful book. Do you have a favourite Roth? Thansk for mentioning the movie. I’ll see if I can find it. I have this one on my virtual TBR since Max’s review. Your post confirms I should really read it. I could suggest it for next year’s Book Club. That would be a great suggestion because there’s a lot to discuss. This sounds wonderful. I read Hotel Savoy which I liked but didn’t really wow me, unfortunately. They are very different, so there’s a fair chnace you’d like this more. But I loved Hotel Savoy as well. Great review, Caroline. Another one for the TBR pile. Thanks, Carole. I hope you’ll enjoy it. What a powerful review of a classic novel. I’ve heard so much about Joseph Roth, all of it good. He’s someone I must get around to reading. Thanks, Litlove. I hope you will. I’d love to hear what yout think of him. This sounds wonderful. It must have been so hard for him to write alcoholic characters, because alcoholics are usually in denial and don’t want to think about it, let alone write about it. I think he was brave. That whole moral courage thing is so difficult to get right in fiction and it sounds as though he succeeded here. My Roth list is growing…. This is such a beautiful book. I don’t think Roth was ever in denial of his drinking. He and Irmgard Keun must have been quite a pair. It was interesting reading these two books one after the other. One is witty, the other one fill of amazing descriptions. The snow puzzled me as well. It’s an automatic thing. I could turn it off but since we never ger snow – or only every ten years or so – I like it. This sounds good, too! To be honest this story appeals to me a bit more than the War & Lit readalong book by him. I have an interest in stories set during those days of the Austro Hungarian Empire (Zweig has also written about that period). It’s not one my library has but maybe I can find a used copy somewhere. Have you read most of his work? This was fanatstic and it would have been the perfect choice. Still, I think you’d like Hotel Savoy but thsi sis a great starting place too. It’s just a very different Roth. I’ve not even read a ll of the most famous book – I still need to read Job – but I’ll read most of them eventually.